Tilt switches on new wind farm. Tilt Renewables Ltd (NZX & ASX: TLT) has brought online its 54-MW Salt Creek wind park in western Victoria, and started exporting power to the grid. The website RenewablesNow said Tilt will proceed with further testing and commissioning of the new Australian facility over coming weeks, expecting to kick off commercial operations and reach full power production in July. Salt Creek is powered by 15 turbines supplied by Vestas Wind Systems. The output of the machines – now in place - will be sold under a power purchase agreement (PPA) with the Australian unit of Meridian Energy Ltd (NZX: MEL; ASX: MEZ). RemewablesNow said the electricity retailer will take half of the plant’s output at a fixed price until the end of this year and then purchase the entire output from January 1, 2019 to end-2030. The remaining 50% of generated electricity in 2018 will be sold into the wholesale market, including through forward contracts. 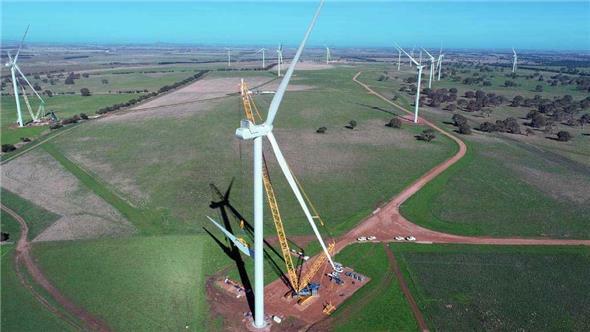 The Salt Creek wind park was built under an engineering, procurement and construction (EPC) contract with Vestas and Australian firm Zenviron Pty Ltd. It will be operated and maintained by Vestas for 25 years, once it moves into the operational phase. The Salt Creek wind farm, photographed last week by The Weekly Times.